Hydrophilic catheters are the preferred cathing system for those who experience the sensation of pain, pressure, or discomfort during the cathing process. Hydrophilic catheters come pre-lubricated and always optimally hydrated to promote excellent gliding properties that ensure easier, more comfortable insertion. Hydrophilic catheters have been shown to lead to better patient satisfaction with this type of technique by reducing the risk of urethral damage due to decreased friction. How Do Hydrophilic Catheters Work? Hydrophilic coated catheters have a layer of a pre-lubricated coating that is bound to the catheter surface. The pre-lubricated coating absorbs and binds water to the hydrophilic catheter, resulting in a thick, smooth and slippery surface. The coating layer remains intact upon introduction into the urethra and ensures lubrication of the urethra in its entire length. Hydrophilic catheters contain a sterile saline solution, which may be present in the package itself or in a foil packet. 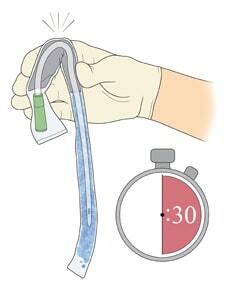 If the catheter has a packet, you must first release, or burst, the hydrophilic properties of the catheter. To do this, unfold the package and then fold the water packet about half way and apply pressure with your thumb and forefinger to burst the package and release the solution. Make sure that all of the solution is released from the foil packet and that it has fully coated the catheter. Allow 30 seconds to fully hydrate. When you order catheters from 180 Medical, your satisfaction is guaranteed. We deliver superior service and we stand behind it. If you are a catheter user but have never discussed your ideal choices for catheter products with someone, please give us a call at 1-877-688-2729. Your health is too important to risk not using the right catheter products. You have been very helpful, unlike some other companies I have tried to get supplies from in the past. Thank you!